The National Collegiate Athletic Association technically lost its case against the plaintiffs in the Alston v. NCAA legal battle by way of Judge Claudia Wilken ruling that the NCAA is no longer permitted to put a hard limit on compensation or benefits related to education for Division I men’s and women’s football and basketball athletes. On March 22, the NCAA filed a notice of appeal to the 9th Circuit Court of Appeals. In the meantime, on March 26, the plaintiffs filed a motion for attorney’s fees, seeking a whopping $44.92 million in attorney’s fees and an approval of reimbursement of $1.35 million in expenses and costs incurred. They are also asking for service awards of $15,000 for each plaintiff who testified at trial and $10,000 for other plaintiffs who participated in discovery. The lawyers for the plaintiffs claim that they have spent more than 51,000 hours in attorney and professional time on the matter over the span of five years. They say that the $44.92 million in attorney’s fees represents the value of their time spent on the case, along with a “modest multiplier” of 1.5 based on the alleged degree of difficulty relative to the risk and investment that they undertook and the value of the relief to their clients. 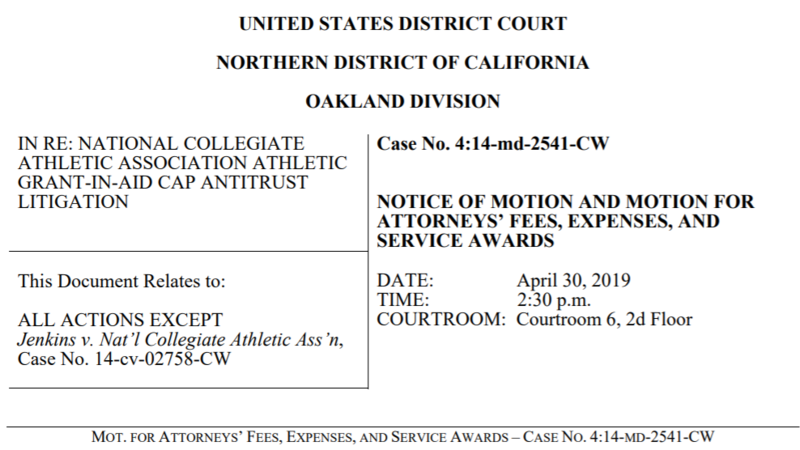 The motion cites to plaintiffs’ expert economist Daniel Rascher in an effort to justify the claim that the relief awarded to the plaintiffs at trial should be valuable to college athletes. It says that Rascher believes the new education-related benefits could, conservatively, be worth up to $100,000 per athlete over a four-year period and up to $235 million annually to the entire classes of individuals who are eligible to receive enhanced aid under the order (now pending appeal). $44.92 million in attorney’s fees, if awarded, would be close to the amount provided to attorney’s in the O’Bannon case, wherein the court awarded $40.79 million in fees. The motion seeks to justify the multiplier of 1.5, bringing attorney’s fees above that amount awarded in O’Bannon, by claiming that the outcome in the Alston case will deliver much greater economic value for college athletes. Allowing for a modest fee multiplier in such circumstances would help enforce the Clayton Act’s policy to encourage private parties to invest in and successfully prosecute antitrust violations that benefit the public interest. The plaintiffs are absolutely seeking an exorbitant amount of money for their counsel, but they also point out that the litigation lasted more than five years, included a two-year discovery period with more than six million pages of documents reviewed and over sixty fact depositions, as well as eight expert depositions. More than twleve law firms participated in the litigation on behalf of the plaintiffs. Reference is made to the Clayton Antitrust Act, which provides that if a plaintiff substantially prevails in an antitrust action, the court shall award the cost of the suit, including a reasonable attorney’s fee, to the plaintiff. This is designed to incentivize the private enforcement of antitrust laws and deter anticompetitive behavior. The reasonableness of the attorney’s fees section may open some eyes. It is claimed that the hourly rates of plaintiffs’ counsel is consistent with those rates charged by comparable law firms who specialize in this type of case. The high end of the spectrum is a whopping $1,515 hourly fee for partners who have more than forty years’ experience in antitrust litigation and sports law. On the low end is the junior associate, earning $350 an hour. The motion has been referred to Magistrate Judge Nathanael Cousins. No ruling has been issued to date.